Today I have two finishes to share with you. I say "finally" not because they took a long time to finish, but "finally" because I had to wait for one to be published before I could share it. And "finally" because the other is for today's Jelly Roll Party at Ruth's Stitchery. First, the October Jelly Roll Party sample. It was a WIP on August 21 (what was that, 6 weeks ago?). This quilt turned out big! Because I didn't read the directions (OK, directions are for wussies). 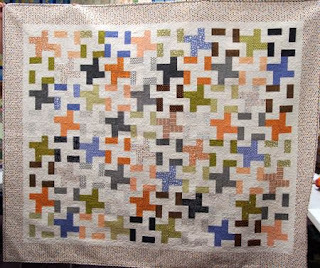 If you look closely, you'll see that half the blocks have the print fabric in the center, and half have the background fabric in the center. I made all the "print in the center" blocks at the August Front Range Modern Quilt Guild sew-in. When I brought the blocks home and put them up on the design wall, I realised "it doesn't look like the picture!" Oh. At this point, I thought "I'll just make it with all 'negative blocks.'" But of course, when it hung in the store, a customer would notice "that doesn't look like the picture on the pattern." So I made the same number of 'positive' blocks. And thought "I'll make two Halloween quilts." But seriously, who needs two Halloween quilts? So I made one big Halloween quilt -- and I'm planning to give it to the son of a friend, whose birthday is on Halloween. Details: Pattern is Jacks be Quick from Cozy Quilts. Jelly Roll is Boo Crew from Sweetwater for Moda (I got mine at Ruth's, last time I checked, they still had one left!) Background fabric is Moda Bella Solids PFD (prepared for dyeing) also from Ruth's. Outer border is also from Boo Crew, I got mine from the Idaho Quilt Barn. Love that Susie's Magic Binding! 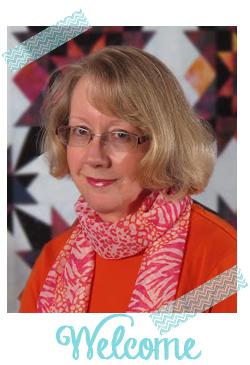 My other "ta da" for today is the first scrappy version of "Star Search" for Quiltmaker magazine's blog, Quilty Pleasures. 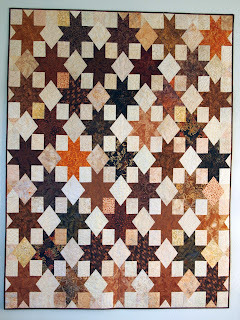 The details and a little tutorial about matching star points is on the Quilty Pleasures blog. Here is "the rest of the story." Ten or so years ago, I started making quilts for each of my Mother's great-grandchildren when they turned 12. The very first one was for Levi, who was actually 15 (how do they grow up without us noticing?). I thought this year was a "bye," that there were no turning-twelves in that generation this year. I was wrong! Along in June, my niece posted a "Happy 12th Birthday, Eric" message on Facebook. Oops I quickly asked her "what is his favorite color?" and she replied "brown." 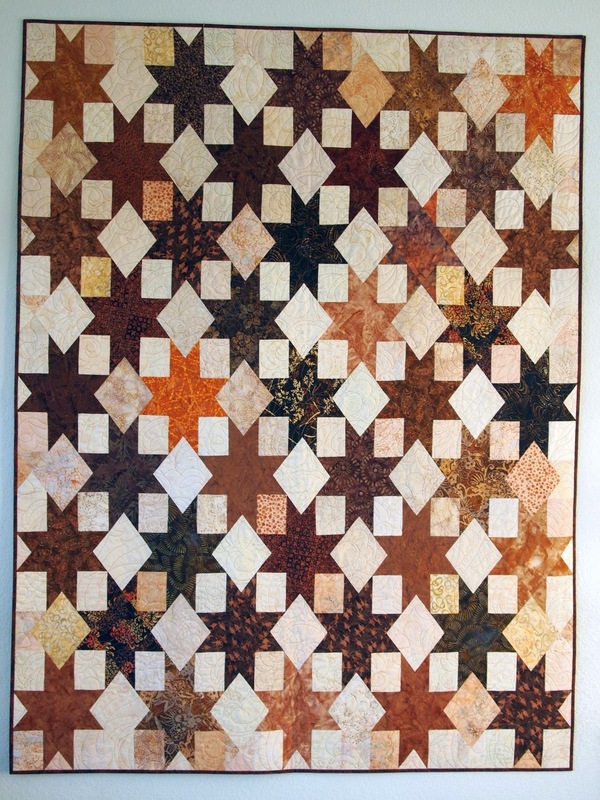 Now I don't think I've ever made a brown quilt, but I had lots of brown batik scraps, so, as they say, "a star is born." I love the way this quilt turned out, and I particularly love the paisley quilting design Cornelia used. I'll pop this quilt in the mail to Eric today and wish him happy birthday -- only four months late! 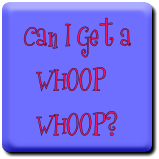 Linking up to Confessions of a Fabric Addict, "Can I Get a Whoop Whoop?" 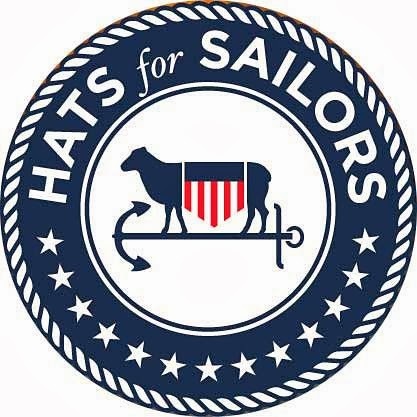 I still have some yarn to share with knitters willing to knit Hats for Sailors. Send me a message if you want some free yarn! Victoria, you are totally "in!" I received the 10th request today, so I'll mail them all tomorrow! You should have some yarn by Monday or Tuesday! I'll include the address to which you can ship the finished hat. I love both the quilts. the star one looks great in shades of brown. The stars quilt is great. The colours have really come alive. Lucky Eric! If someone had told me I needed to make a brown quilt I would have given up before I had started. I must have been emotionally scarred by the 1970s. I love your jelly roll quilt, it has such movement. I like both of them, but the star one is gorgeous. Yes, those children do get older in the blink of an eye. Great work Marti - I wonder how many more 12's there will be??? I especially love Erics brown quilt, what a fine job you did. I love scrap quilts and I love autum colours. Woohoo! Congrats on the publication!! !